The team at Mantis Digital Arts has been working with our advisors, educators, parents, children, and friendly entomologists to review and update the design of Buzz Whizz: Bees. This post provides a few details about the design changes and gives an update on new visuals for the game. The team at Mantis Digital Arts has been reviewing the design of Buzz Whizz: Bees over the past few weeks. We've talked with many parents, educators, children, and our entomologist advisors to review the current design and determine what changes need to be made to ensure the game is factual, educational, and fun. The result brings us to a few key changes in the design which, we hope, are for the better. We will be adding a narrator to the game. 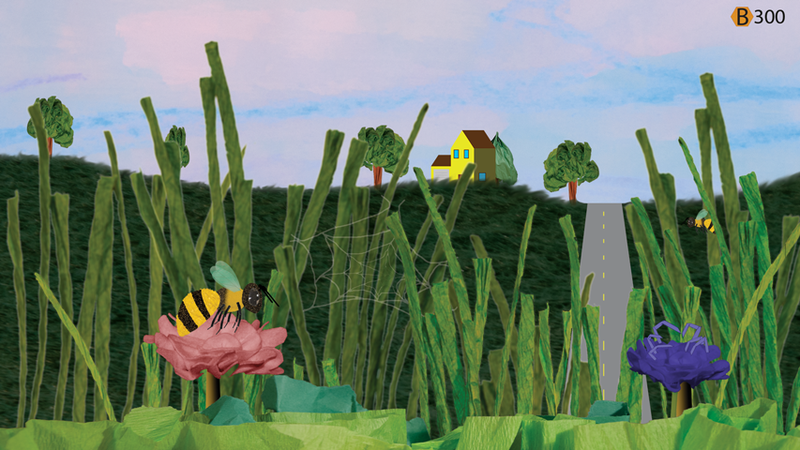 This narrator will be an Entomologist who is guiding the player through the lifecycle for each of the species of bee that is presented within Buzz Whizz: Bees. In addition, the narrator will be acting as a guide to ensure that the player understands what is happening within the game and how their decisions are impacting the bee, the colony, and the environment around the bee. As mentioned above, there will now be a cohesive story told throughout the lifecycle for each bee. Previously, we were focused on creating some linear level design that would take the bee through multiple, interesting environments. In reality, most bees do not really travel that far from their hive. As such, presenting scenarios where the bee flies through valleys, trees, homes, fields, etc...wasn't realistic. As such, we have decided to focus on telling a story centered around the lifecycle for each species of bee. We will start with the formation of the hive and end with the bees going into hibernation. The new design will also allow for children to play through the same species of bee again. With each new play through the same species, they will be playing as a a descendent of the previous colony and the environment will change. This brings us to the final design change. The environment around the bees will be constantly changing based on flowers that they visit and decisions that are made within the game. This will more realistically paint a picture of what happens during the lifecycle of a bee colony and for several generations after. The world changes. The descendants will be larger if the right decisions are made. The plants around the bee will be larger. Fruit and vegetable bearing plants will product more fruits and vegetables. From an educational standpoint, this also allows children to see the consequences of a bee's actions and how bees are beneficial to us and our food supplies. We have also made some iterative progress on the current prototype level that we are building. The image below shows the current work in progress for the visuals in the level. We've also changed the way that we handle animations exported from Spine and imported into Unity. We are now using a combination of JSON and a PNG atlas. You can see the smoother animation in the video below. You can also check out concept animations for our new predator - The Robber Fly. The first video shows the idle animation and the second shows the potential animation that will be used when the Robber Fly grabs the bee. Finally, the video below shows a current play through of the latest development build of the prototype level. You can see the new bee animations have been added. Thanks for taking the time to read through our latest updated on Buzz Whizz: Bees. Let us know if you have any feedback.